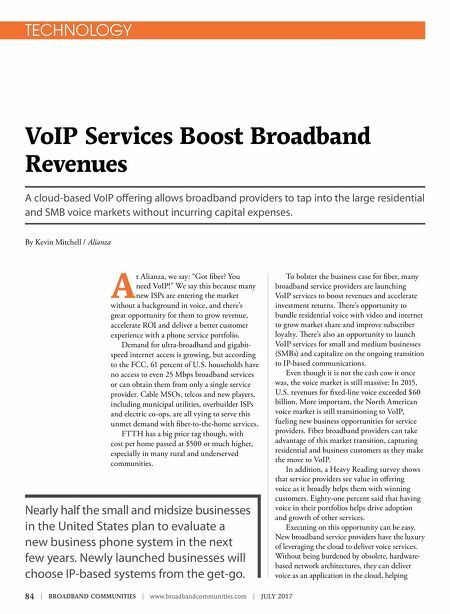 84 | BROADBAND COMMUNITIES | www.broadbandcommunities.com | JULY 2017 TECHNOLOGY VoIP Services Boost Broadband Revenues A cloud-based VoIP offering allows broadband providers to tap into the large residential and SMB voice markets without incurring capital expenses. By Kevin Mitchell / Alianza A t Alianza, we say: "Got fiber? You need VoIP!" We say this because many new ISPs are entering the market without a background in voice, and there's great opportunity for them to grow revenue, accelerate ROI and deliver a better customer experience with a phone service portfolio. Demand for ultra-broadband and gigabit- speed internet access is growing, but according to the FCC, 61 percent of U.S. households have no access to even 25 Mbps broadband services or can obtain them from only a single service provider. Cable MSOs, telcos and new players, including municipal utilities, overbuilder ISPs and electric co-ops, are all vying to serve this unmet demand with fiber-to-the-home services. FTTH has a big price tag though, with cost per home passed at $500 or much higher, especially in many rural and underserved communities. To bolster the business case for fiber, many broadband service providers are launching VoIP services to boost revenues and accelerate investment returns. 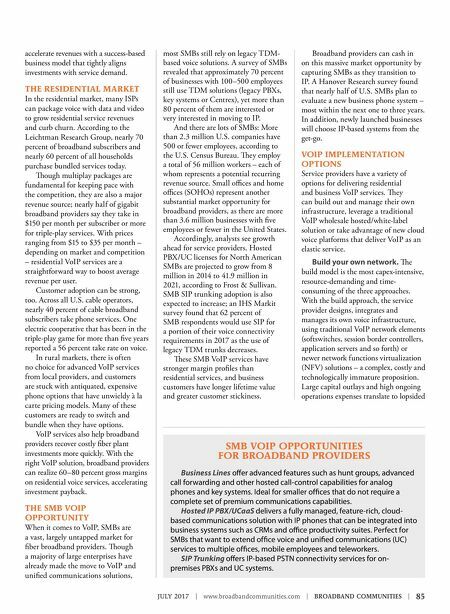 ere's opportunity to bundle residential voice with video and internet to grow market share and improve subscriber loyalty. ere's also an opportunity to launch VoIP services for small and medium businesses (SMBs) and capitalize on the ongoing transition to IP-based communications. Even though it is not the cash cow it once was, the voice market is still massive: In 2015, U.S. revenues for fixed-line voice exceeded $60 billion. More important, the North American voice market is still transitioning to VoIP, fueling new business opportunities for service providers. Fiber broadband providers can take advantage of this market transition, capturing residential and business customers as they make the move to VoIP. In addition, a Heavy Reading survey shows that service providers see value in offering voice as it broadly helps them with winning customers. Eighty-one percent said that having voice in their portfolios helps drive adoption and growth of other services. Executing on this opportunity can be easy. New broadband service providers have the luxury of leveraging the cloud to deliver voice services. Without being burdened by obsolete, hardware- based network architectures, they can deliver voice as an application in the cloud, helping Nearly half the small and midsize businesses in the United States plan to evaluate a new business phone system in the next few years. Newly launched businesses will choose IP-based systems from the get-go.